POPULARITY of miniature golf has brought the game right into the basement in the form of a knockdown course that can be picked up and stored away almost as easily as you would a game of croquet. It’s an exciting game the whole family can enjoy the year roundâ€”from the youngsters on up to the avid golfer who will find it good practice in keeping his putting eye keen. Standard putters and irons are used and scoring is done as in real golf, penalties being counted as strokes. 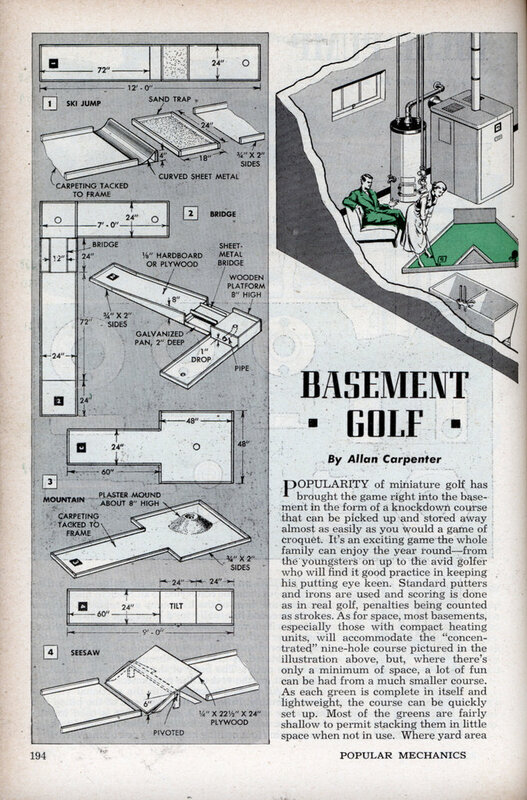 As for space, most basements, especially those with compact heating units, will accommodate the “concentrated” nine-hole course pictured in the illustration above, but, where there’s only a minimum of space, a lot of fun can be had from a much smaller course. As each green is complete in itself and lightweight, the course can be quickly set up. Most of the greens are fairly shallow to permit stacking them in little space when not in use. 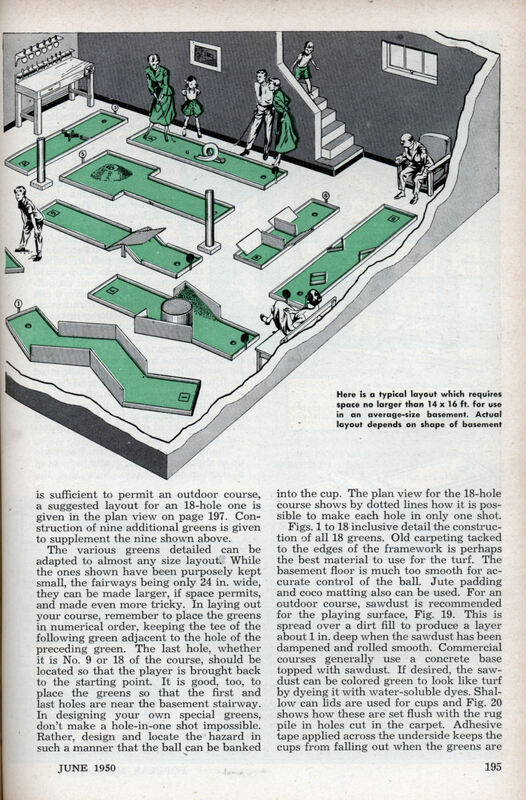 Where yard area is sufficient to permit an outdoor course, a suggested layout for an 18-hole one is given in the plan view on page 197. Construction of nine additional greens is given to supplement the nine shown above. The various greens detailed can be adapted to almost any size layout. While the ones shown have been purposely kept small, the fairways being only 24 in. wide, they can be made larger, if space permits, and made even more tricky. In laying out your course, remember to place the greens in numerical order, keeping the tee of the following green adjacent to the hole of the preceding green. The last hole, whether it is No. 9 or 18 of the course, should be located so that the player is brought back to the starting point. It is good, too, to place the greens so that the first and last holes are near the basement stairway. In designing your own special greens, don’t make a hole-in-one shot impossible. Rather, design and locate the hazard in such a manner that the ball can be banked into the cup. The plan view for the 18-hole course shows by dotted lines how it is possible to make each hole in only one shot. Figs. 1 to 18 inclusive detail the construction of all 18 greens. Old carpeting tacked to the edges of the framework is perhaps the best material to use for the turf. The basement floor is much too smooth for accurate control of the ball. Jute padding and coco matting also can be used. For an outdoor course, sawdust is recommended for the playing surface, Fig. 19. This is spread over a dirt fill to produce a layer about 1 in. deep when the sawdust has been dampened and rolled smooth. Commercial courses generally use a concrete base topped with sawdust. If desired, the sawdust can be colored green to look like turf by dyeing it with water-soluble dyes. Shallow can lids are used for cups and Fig. 20 shows how these are set flush with the rug pile in holes cut in the carpet. Adhesive tape applied across the underside keeps the cups from falling out when the greens are moved. A small square of carpet with a numeral painted in the center is glued to . each green to serve as a tee. A can-cover marker attached to the far end of the green identifies each hole. Green No. 1 features a hazard of curved sheet metal to lift the ball over a sand trap. In green No. 2, an inclined fairway carries- the ball over a small bridge. If it misses the bridge, the ball -falls into a shallow pan of water, with the player being penalized one stroke for lifting it out. The lower end of the pipe which guides the ball to the cup should be in direct line with the cup to permit a hole-in-one shot. The mountain, green No. 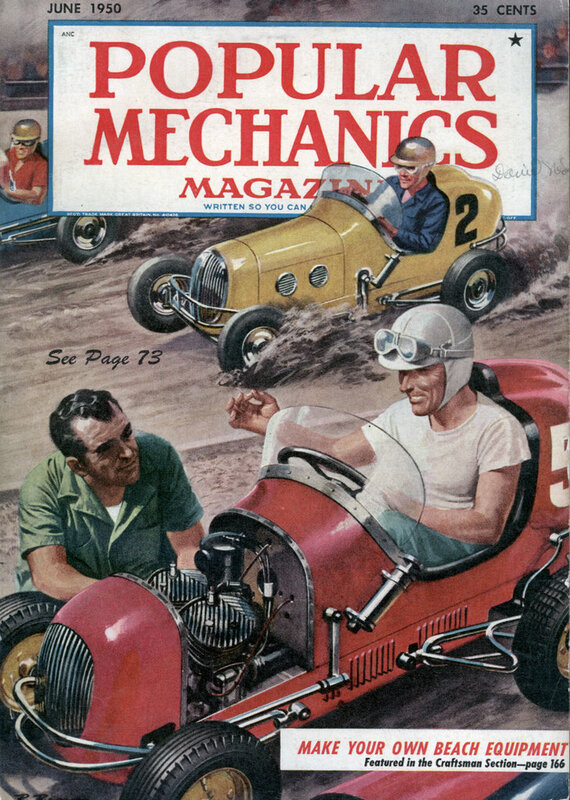 3, has the cup placed in the center of a mound of plaster of paris. The hazard at green No. 4 consists of a plywood panel critically balanced so that the weight of the ball in rolling over it causes the panel to tilt forward toward the cup. In the case of an outdoor course, the hill in green No. 5 can be formed from a mound of dirt, but in-doors it is made from sheet metal or linoleum which is bowed and placed across the center of the fairway. An alternate hazard is provided at this hole in the form of a hurdle which is a board set vertically over which the ball must be lifted. For this shot an iron is provided and left at the hole after play is completed. The maze at green No. 6 is formed from strips of 1/2 x 1-1/2-in. wood which are tacked in place to the carpeting from the underside. The obstacle for green No. 7 is made up of short pegs set vertically in front of a sheet-metal bunker. Note that the center space between the pegs must line up with the cup to permit a hole-in-one shot. The pegs can be fastened in position by nailing a wooden strip across the underside of the carpet fairway and then driving screws through the strip and up into the pegs. The strip, cut to fit between the side members, causes a slight hump directly under the pegs. This adds to the difficulty of making a hole-in-one. The pivot point for the turnstile at green No. 8 is placed off center of the fairway so that the blade at the right-hand side is directly in line between the tee and the cup. Be sure that the amount of clearance under the turnstile will not allow the ball to roll under it. The bazooka hazard at green No. 9 consists of a length of small stovepipe placed at an angle, the lower end being sunken slightly in the green to permit the ball to enter the pipe easily. On an outdoor course, green No. 10 is built around a tree if possible, although a barrel or a 5-gal. paint pail will serve the same purpose. The fairway is sloped on each side of the tree to bank the ball. Dirt or concrete can be used to form the bank on an outdoor course, while indoors a piece of wood and sheet metal are used as shown in detail A, Fig. 13. The pegs at green No. 11 are placed so that a narrow path is kept open between the bank board and the cup. The proper angle to set the bank board so that it directs the ball into the cup is found by experiment. In building this green, the bottom of the framework must be covered with a panel of plywood or hardboard so that the pegs can be attached to it after the carpet is in place. Simple wooden forms provide the obstacles along the fairway of green No. 12. A bank shot against the right or left-hand side boards is required to make the hole. L-shaped green No. 13 also requires a bank shot to direct the ball to the cup. Here, the player must be careful not to hit the ball too hard as it is easy to overshoot the top of the bank and go out of the green. When this happens the player is penalized one stroke. Green No. 14 requires a trick shot to make the cup. Three inclined boards, staggered opposite each other, and two vertical obstacles placed across the fairway require rolling the ball up over the inclined pieces to get around the two vertical obstacles. Here, either cleats or a plywood bottom must be fitted to the framework to permit nailing the obstacles in place. Green No. 15 requires another bank shot and accurate aim. The incline, detail B, is formed from sheet metal and plywood and is located the distance indicated from the cup. This can be fastened directly to the carpet. Green No. 16 requires a triple-bank shot to make a hole-in-one. Bank boards are erected along the sides of the fairway at the points indicated. Sinking a putt on green No. 17 is a lot of fun and requires a good shot to make the ball loop the loop through a section of old auto tire. The ends of the tire are spread apart as shown and screwed in the center of the fairway to a baseboard nailed to the edges of the framework. Wooden baffles are erected at each side of the tire so that the ball must pass through the tire to enter the cup. The fairway of green No. 18 is made V-shaped, with a bank shot being required to sink the putt. A water hazard is installed level with the surface of the fairway so that the ball can roll into it. A triangular shaped pan of sheet metal about 2 in. deep is made to set down into the green. This requires making the frame members wider than actually shown to permit raising the fairway. The bank board is made of a piece of plywood. Excellent site for us newbie Cub Scout Master. how do you get a hard copy of these directions, cannot be printed from this site! !